I enter my Algebra II classroom two minutes before class, open my computer and plug it into the SmartBoard. By the time it powers up, most of my students have entered the room and are sitting down and chatting. I pull up the day’s SmartBoard and I get started. The day before was exhausting, and I was in a cranky mood then. (My Algebra II kids didn’t see this, because I gave them a test that day.) I tell my kids we all have bad days, but that when I was thinking “argh, bad day!” I started thinking of all the good that I have, and I thought of my wonderful Algebra II class. (Which they are.) So I wanted to let them know that. They liked hearing that. I liked saying that. It was a nice 30 seconds. And we got started. I talked about how we’ve done so much algebraic manipulation and solving so far. Absolute value equations, exponent rules, radical equation, inequalities. And we’ve done some baby graphing (lines, crazy functions which we used our calculator to graph). But today, I said, was going to be a turning point in our course — and graphing would be the emphasis. I then go on to explain it in more detail to those who still don’t see it. And then I explain how the two zeros are going to be complex (because they have a real part and an imaginary part). I see nods. I feel comfortable moving on. And we discuss, and realize there will only be one real solution. This gets added to the chart. I then ask them to spend 15 seconds thinking about this — what they just learned. To see if it makes sense, or if they have any questions. Just some time. I suddenly realized that for some of my kids, we’re now in the land of abstraction. There is this new thingamabob with a weird name, the discriminant, and the students don’t know what it’s for or why we use it. We’ve been talking about s, s, and s and even though we’ve done a few examples, it isn’t “there” for the kids yet. I throw on the board. He nods approvingly. Then I ask what the solution or solutions are for that equation, and they find the one real solution. Which gets repeated twice when we factor. And I get called out (rightfully so!) on improper mathematical language (imaginary vs. complex). So I fix that. I’m feeling slightly guilty about asking the two students to use the discriminant instead of the QF to answer the question, because who cares!, and so I tell the class that the discriminant is just a short way to tell the number and nature of the solutions, but don’t worry if you forget it, because you can always pull out the big guns: the quadratic formula. Which will not only tell you the number and nature of the solutions, but also what the solutions are! 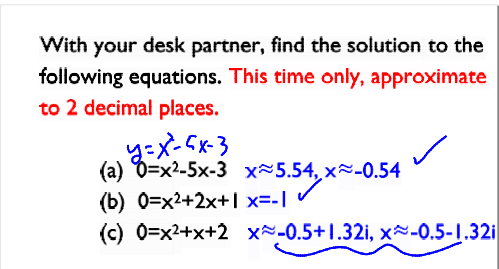 And I have them work with a desk partner to solve three quadratic equations using any method they like (they only know factoring, the quadratic formula, and completing the square). They get the right answers, for the most part. The ones who aren’t getting it right are having trouble using their calculator to enter in their quadratic formula result. I want to move on, because of time, so I tell them that we can go over calculator questions in the next class but I want them to put those aside so we can see the bigger picture now. At this point, I haven’t pointed out the x-intercepts, but I asked students to see if they can relate the two questions. I grow a bit impatient, and I point to one x-intercept, and then the other, for the equation. Hm. They start to see it. We then look at the equation. Finally, the equation. Which doesn’t have any x-intercepts. Which confused some. Someone said “that’s because the solutions are complex.” I pointed and said something like “yeah!” and then tried to explain. Some students got confused, because we did plot complex numbers on a complex plane, so they were like “you can plot complex solutions too!” I tried to address their concerns, by saying that the x-intercepts show us the solution when . But the x-axis is a REAL number line, not a complex number line. I don’t think they all got what I was saying. This all took about 30 or 35 minutes. I somehow totally forgot to do something key: bring the discussion back to discriminants. 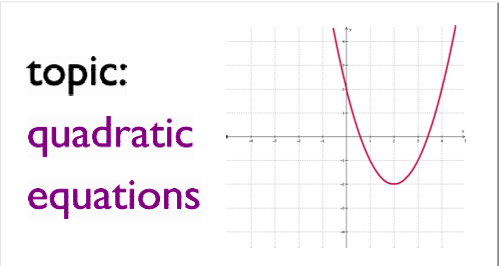 I didn’t ask them “so what can a discriminant tell you about a graph of a quadratic?” It might be obvious to us, but I guarantee you that only a few kids would actually be able to answer that after our lesson. 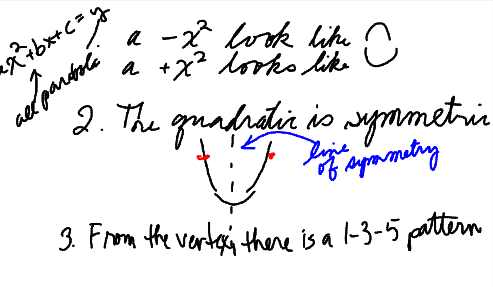 We spend the remaining 15 or 20 minutes on graphing quadratics of the form and by hand. The students were working in pairs. Then at the end we make some observations as a class. Class ended, and then I had more work to do. 1) I’m in a teacher funk. You can see it in this class. I didn’t work backwards. 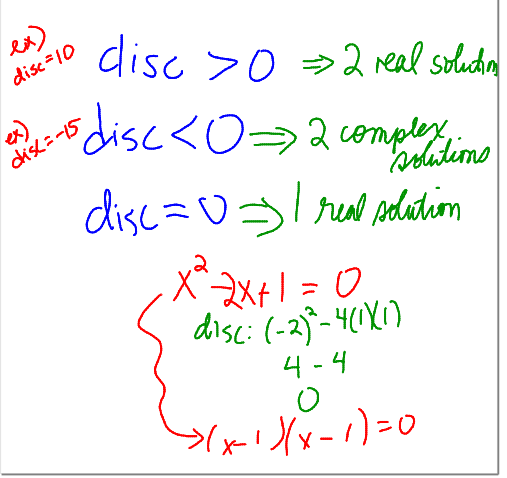 I gave them what they needed to know (the discriminant), and then motivated it second. I did lots of teacher centered things. I rarely let them discuss things with each other. Blah. Especially for something conceptual, not good. Not terrible, not good. 2) Teaching is exhausting. Anyone who teaches knows that even in a non-interesting lesson like this, a teacher has to constantly be thinking “what do my kids get?” and “do I need to say that again and reword it?” and “do I address the calculator issue of 2 kids when 15 seem to be okay?” Basically, every 10 seconds is a choice that needs to be made, a thought about how to adapt, where to go, what to do. Honestly, personally, I think the whole idea of the discriminant is stupid and I would have no problem doing away with it. It’s a term with very little meaning and almost no use. But I am asked to teach it, so I do. Regarding 1). I think doing teacher centered things are fine, especially if you are re-mediating while you teach. Students come to me sometimes much lower than they should be in a honors class. Letting them discuss would be a waste of time in the best case. Worst case is they confuse each other and learn the wrong things, they are better off if they didn’t even chat about math in those instances. Regarding 2) I totally agree with that. It’s also exhausting sometimes when you are figuring out where a student has a misconception. Sometimes they resist what you teach because they learned something incorrectly in a previous class, so you have to do some diagnosis instead of just going with “this is the way it is, and I’m the teacher so I’m right.” It’s also harder when you have 40+ students in a class. I ask many questions and walk around a lot in class. 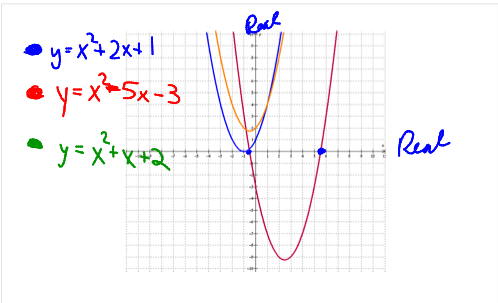 Another connection you can try is rewriting the quadratic formula as x= -b/2a +- sqrt(b^2-4ac)/2a. x=-b/2a is the axis of symmetry and sqrt(b^2-4ac)/2a is the horizontal distance from the axis of symmetry to the zeroes of the quadratic on the x-axis. I keep reminding them that they don’t have to remember a separate formula for axis of symmetry; it’s the first part of the quadratic formula. When the discriminant is positive, there’s 2 zeroes that are sqrt(b^2-4ac)/2a units away from the axis of symmetry on the x-axis (one on the left and one on the right, hence the +-). When the discriminant is zero, the 2 zeroes are right on the axis of symmetry. When the discriminant is negative, well you get the idea. This might also be a good time to show them how to use different line styles for different graph on TI calculators. 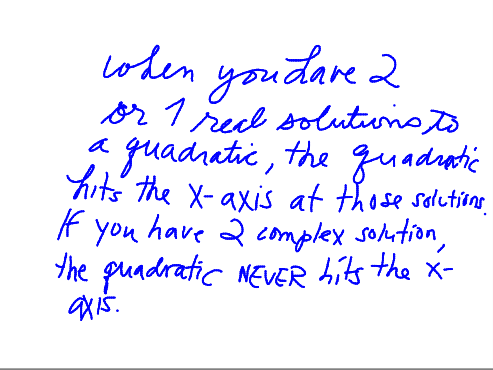 A quadratic has 2 distinct solutions that are additive inverses. What can you tell me about a, b, and c? If a quadratic has no real solutions, must the solutions be complex conjugates? I don’t see discriminants coming up in meaningful ways outside of math competitions. I guess I half-agree with . Well sheesh, Sam! Hand in your teaching card right now. 1. The fact that you’re reflecting on this makes you a better teacher than half of them at my school. 2. The fact that THIS lesson is causing you problems makes you better than most of the rest. This is an abstract lesson and it’s really hard to get students to understand/figure this out on their own on the best of days (yours and theirs). We all get in these funks and “regress” to this type of teaching. From my experience, believe it or not, SOME (not all) students actually feel more comfortable with this type of teacher-centered learning. Anyhow, we’ve all been there. It’s days like these that I apply my saying, “The worst thing about a bad lesson is when the kids don’t even know.” Your students probably do not even recognize this as a “bad” lesson. On the one hand, it can make you feel better about not ruining their lives. On the other hand, we still hope they got the lesson in a more meaningful way than just being talked at. You’ll climb out of this funk. Step 1 is admitting your problem (in a public forum for accountability). The fact that you were able to teach a lesson as complex as this on a Friday and have them all engaged is amazing if you ask me. I think you are not giving yourself enough credit. If you go back in on Monday and do a little review and reteach, I think you’ll see the light bulbs going off right and left. Some concepts just need to marinate in the brain a little while. I think your approach here is fine. You can’t hit a home run on every lesson, but you should keep swinging for the fences! 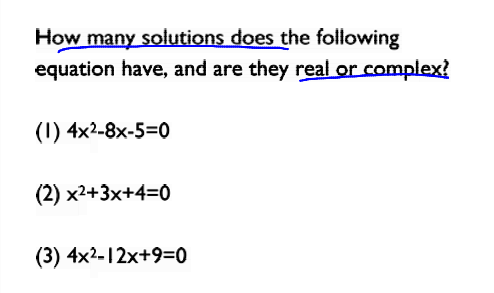 Is it worth nit-picking that the real solutions are also complex solutions? 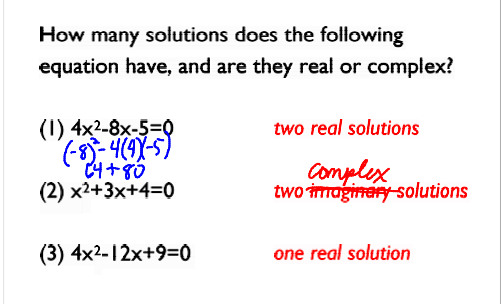 One of the most common mistakes I come across when I ask students for all “complex” solutions to a polynomial is that they will only give the non-real ones (even though I can see in their work the real solutions). It’s just a thought… I’ve been reading your blog for about 6 months and it’s so thoughtful and reflective. I was a little surprised to see real solutions characterized as different from complex ones. I should be clear that I didn’t post this because I think it’s a bad lesson. It wasn’t great, it wasn’t bad. And I’m not *upset* about it in anyway, or think I’m a bad teacher about it or anything. It just was sort of backwards. But I teach like this a lot, and I am going to own that. I am just not as student centered as I want yet. Part of the post was that I am in a bit of a funk in general. But really I should have said that the point of this was to show people who argue how easy teaching is that even for a lesson like this, that SO MUCH needs to happen. That you have to be ON all the time. You have to carefully construct the order of things. You have unanticipated problems. You have to adapt and connect and go forth, adapt and connect and go forth. @CalcDave, “We all get in these funks and “regress” to this type of teaching. From my experience, believe it or not, SOME (not all) students actually feel more comfortable with this type of teacher-centered learning.” Yes. I was that student. @Mike, yes, yes, I should have said “no real solutions” or “two distinct complex solutions” — especially since they just were asked true-false questions about the number systems on their last assessment. I’d actually like to see more people writing up posts like this. What, how, what order they presented something, how they knew whether it was working, what decisions they made along the way. Those who blog myself included I think sometimes feel obligated to only write up the groundbreaking lessons with cool-factor. But honestly many people, myself included are delivering much of their instruction this way due to forces beyond our control. I learned a ton from you deciding to write up a narrative this way. Let’s get more people to do it. Here here! (Or is it hear! hear!) We talk about the great. We talk about the failures. (Sometimes, anyway.) We talk about interesting mnemonics and fun ways to get into the material. We talk about funny, precious, poignent moments. But what about the everyday? For me, this is more like the everyday than most other things I write about. One little “extra” I like to throw in with the discriminant is how the kids can use it to help determine if a quadratic is factorable. I help them write a quick program for the 83/84, and then they can use it to decide if they can factor. I think this serves two purposes. The better kids will see the connection between the “nice” zeros and factored form, and the weaker kids will have a technique they can use in the future to find the “factorability” of a quadratic. Don’t brush off the applicability of the discriminant so quickly! 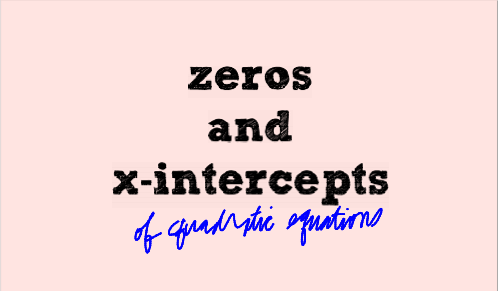 Even though they could solve many of these problems using the quadratic formula it is much quicker and less error prone to use the discriminant – especially once the QF is memorized. It’s like building an additional floor on a skyscraper; you don’t need buy more land. Teaching them to use that unwieldy part of the QF helps keep it in mind because the radical is no longer mysterious. I’m trying to remember my days as a high school student, currently a college freshman.